The Haunted Windchimes sound draws from traditional folk and American roots music. The songs have a vintage quality, as if they might have been written yesterday or 75 years ago. Grounded in honeyed harmonies and spirited pickin’, it lies in a nowhere land between distinct styles: It’s not quite bluegrass or blues or country. Still, there are elements of all those in songs that paint pictures of empty train stations and nights of passing a jug of moonshine around. It’s the vocal harmonies that really set them apart, a three-headed juggernaut of Desirae Garcia (ukulele), Chela Lujan (banjo) and Inaiah Lujan (guitar). “When their voices blend, it is nothing short of beautiful,” writes Bill Reed of The Colorado Springs Gazette. The sound is often moody and melancholy, but it is always deeply affecting. That sound is embroidered by the instrumental mastery of Mike Clark (harmonica, guitar and mandolin) and the standup bass foundation of Sean Fanning. 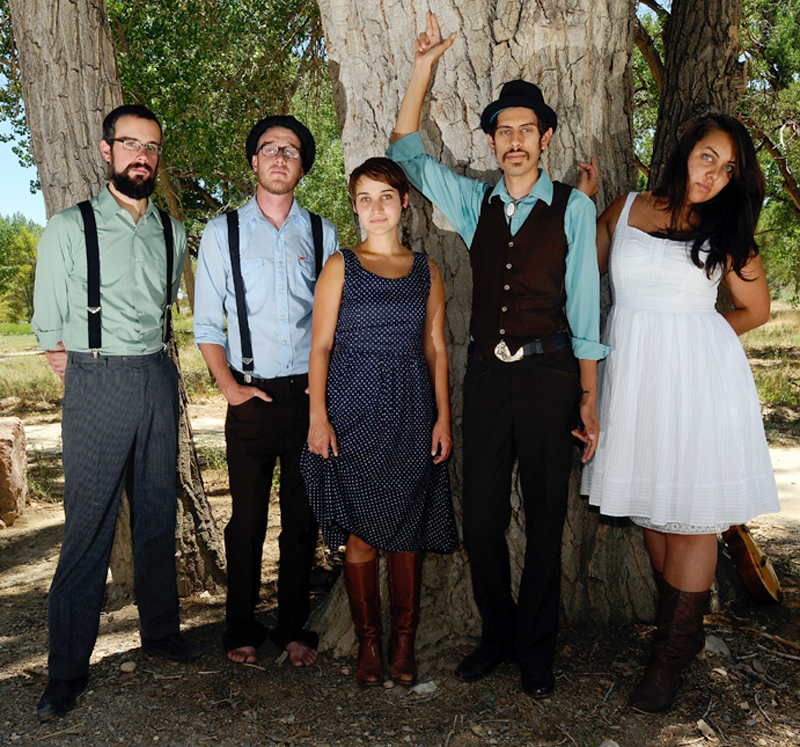 On the group’s 2006 debut EP “Verse/Visa”, The Haunted Windchimes presented what Denver Post journalist, Eryc Eyl, called “a beautiful chamber pop sound.” However, with 2010’s “Honey Moonshine,” the band “perfected an old-timey hoedown sound, executed with passion and precision.” Last May, the band released “Live at the Western Jubilee,” a celebration of its career so far. Recorded in December 2010 at the Western Jubilee Warehouse, a legendary Colorado Springs venue, the record’s 13 tracks capture the five musicians in peak form in front of an appreciative audience.